In 2006, Delta Chi and the V Foundation joined together to fight cancer. 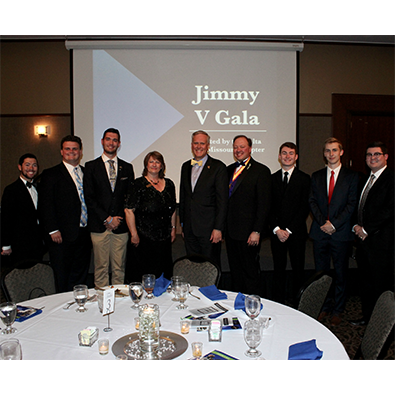 The Delta Chi Fraternity recognizes the prevalence of cancer among its own communities and has raised over $1 million for the V Foundation for Cancer Research since the partnership was formed. The V Foundation for Cancer Research was founded in 1993 by ESPN and the late Jim Valvano, legendary North Carolina State basketball coach and ESPN commentator. Since 1993, the Foundation has funded more than $170 million in cancer research grants nationwide. Valvano's "Don't Give Up . . . Don't Ever Give Up!" ® spirit is alive now more than ever. With continued support, we will forge ahead with innovative research. The brothers of Delta Chi are continuing to come up with creative new ways to fundraise for life-saving cancer research. Thank you for supporting this partnership. Together, we will achieve victory over cancer! A toolkit of resources, including: event planning checklists, sample solicitation letters, donation forms, and poster templates. V Foundation Supporter logos that can be used by registered chapters. Since 2006 the Delta Chi Fraternity has partnered with the V Foundation for Cancer Research to further the cause for a victory over cancer. Delta Chi chapters around the country have raised over $1,000,000 since 2006. The Delta Chi Missouri Chapter comprised of roughly 120 brothers have been a strong contributor to the V Foundation.